It's the Little Things. . .: Yay --- A Quilt Retreat!!!! 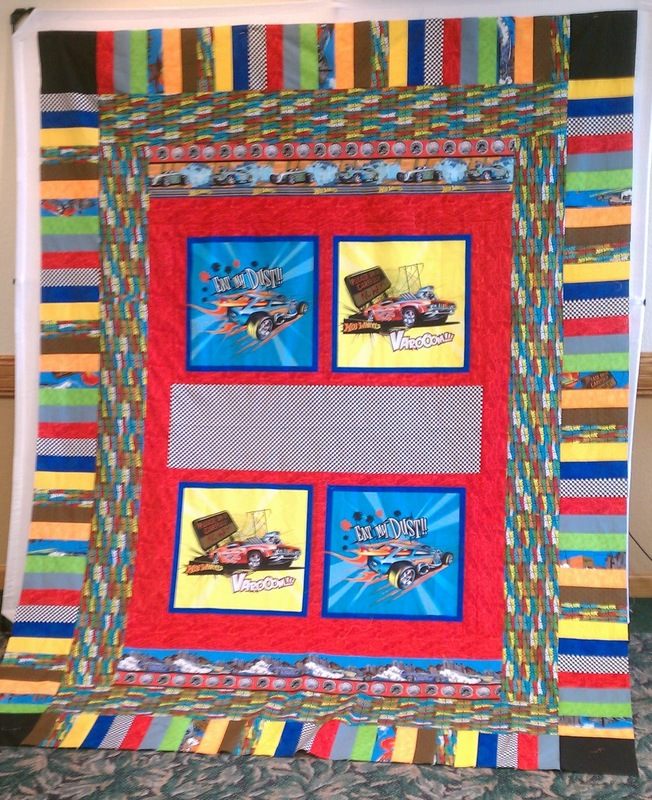 Yay --- A Quilt Retreat!!!! Earlier this month, I had the opportunity to go on a quilt retreat with a bunch of great ladies. 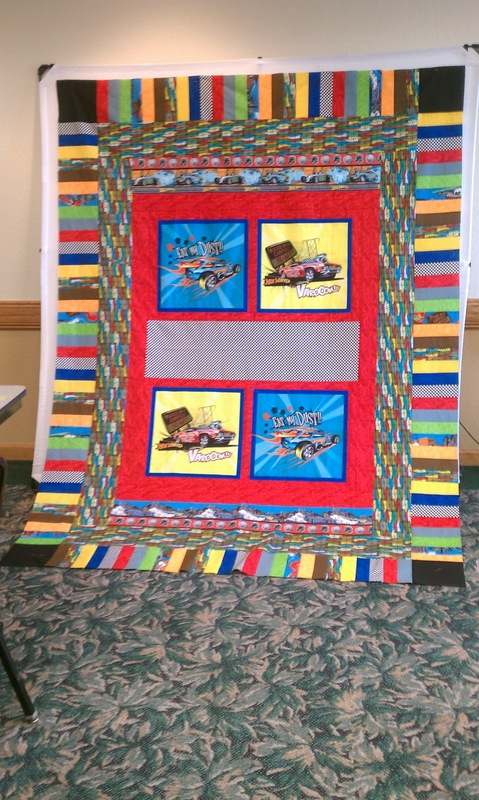 Three days of quilting, food and fun! Oh, yeah! I decided I was going start working on those "in progress" projects and packed up 15 projects to work on. I know, it sounds ambitious, but some of the projects only required adding a border or two. No. 1: This one is for my grandson, Liam -- he LOVES HotWheels!! 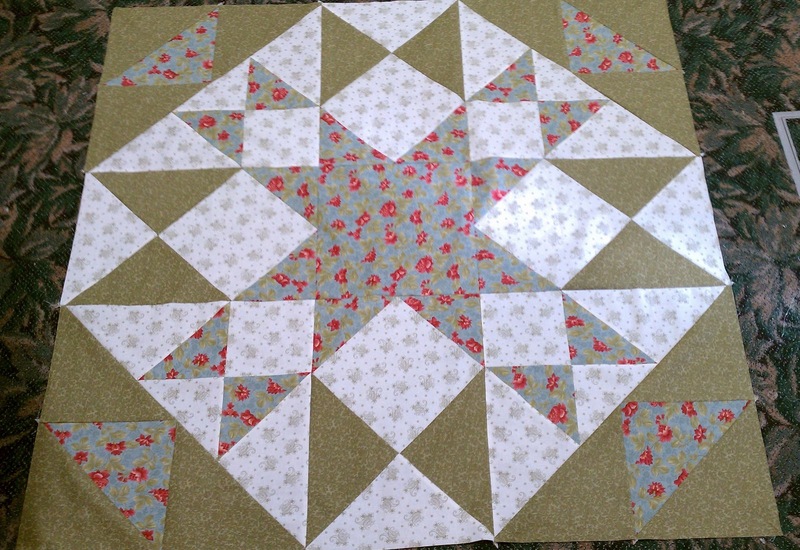 I purchased the fabric not knowing what the quilt was going to look like -- I knew it needed to be a twin so I started with the center and worked my way out. 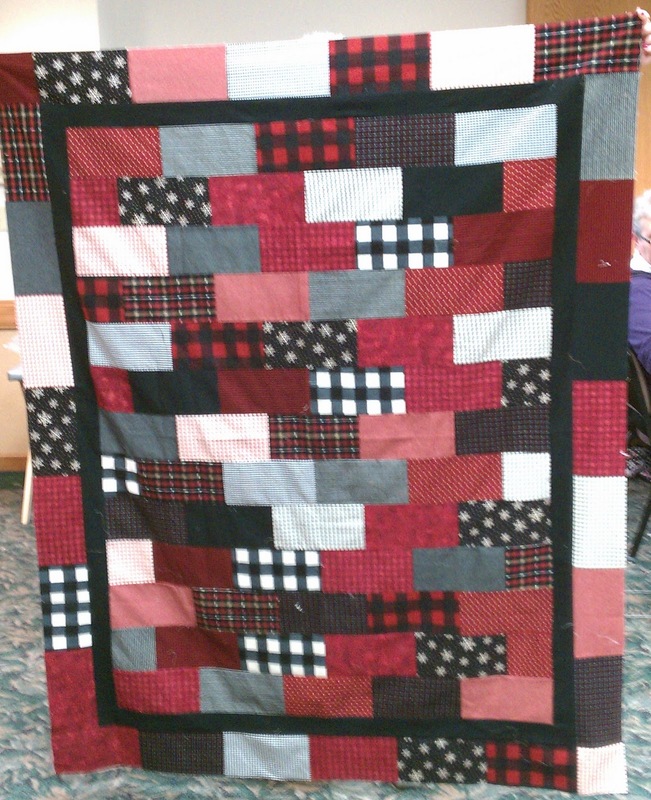 The center is a black and white check (like a finish flag) and I plan on adding his name using machine embroidery applique. I'm also going to order a pantograph of race cars and finish flags. I have enough fabric left to make him a coordinating pillowcase! I can't wait to see his face when he sees it for the first time. No. 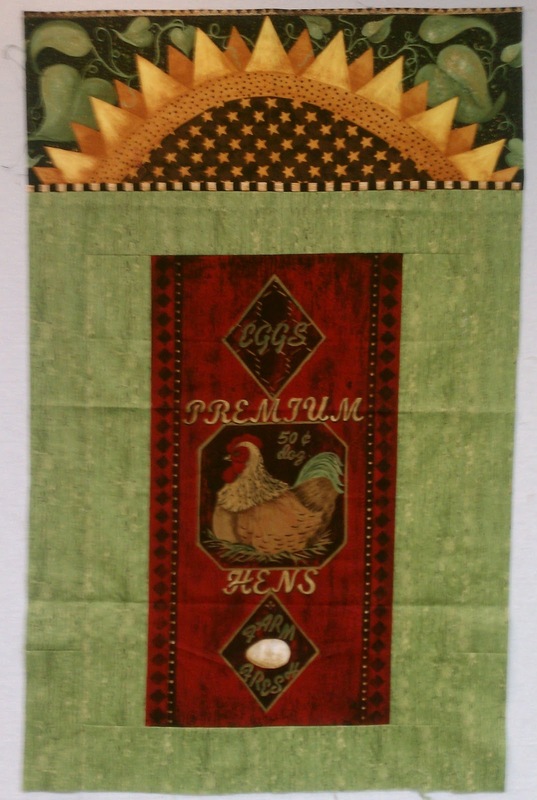 2: This will end up being a wall hanging. I added extra green fabric to the sides so it would measure the same width as the sunflower topper. No. 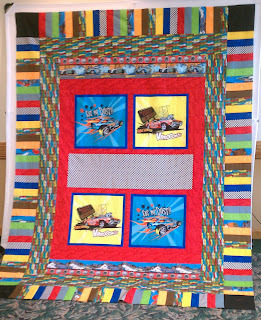 3: This throw is made with 3 Sisters fabrics. I only had to add the two red side borders and cornerstones. No. 4: I started this one at the last retreat I attended two years ago. Again, it just needed the outer borders and it was done. Fabrics are by American Jane. No. 5: A jelly roll quilt using a Roll Play by Pieced Tree Patterns. I had to add both the inner and outer borders to this one. 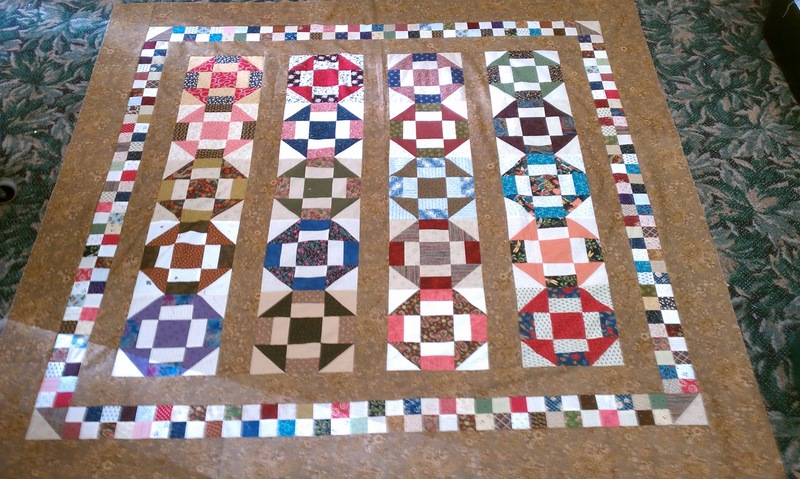 I realized I didn't have enough of the outer border so I took a table topper I had made using leftovers from the jelly roll strips and "unpieced" it to form the cornerstones. No. 6: This quilt is from a Terry Atkinson book -- I think it's called "Big Jake" ... it's not quite big enough to use as a quilt on a double/full size bed but could be folded and laid across the bottom of the bed. I'd like to finish this one and give it to my Mom for her bed. I'm envisioning some pretty feathers in those big white spaces. No. 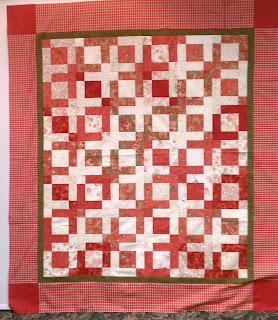 7: I taught a "Saturday Scrappers" class at my "favorite LQS" (Fabric Town in Apple Valley --- I just happen to work there as well) -- and the block used in this quilt was one I shared with the class. 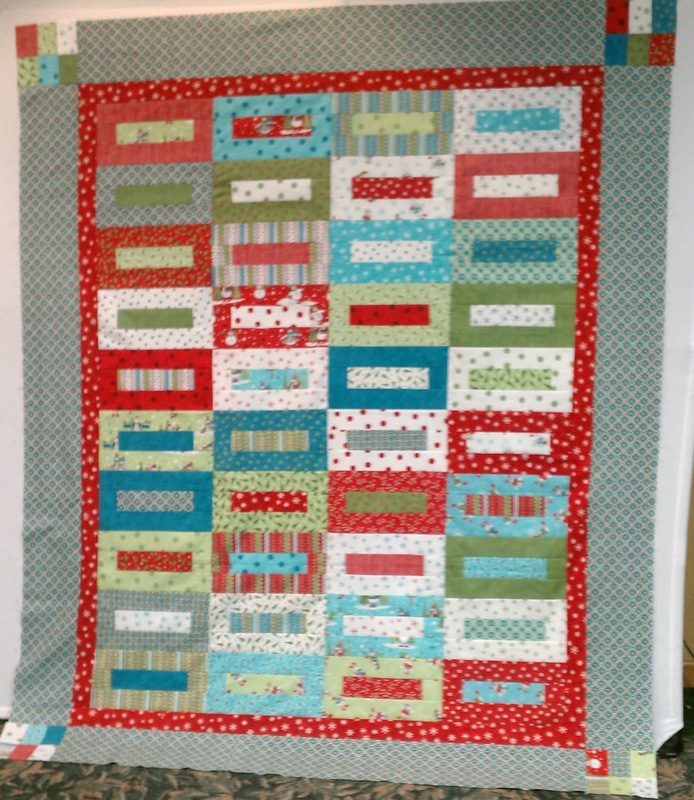 I made up several blocks and designed my own quilt. 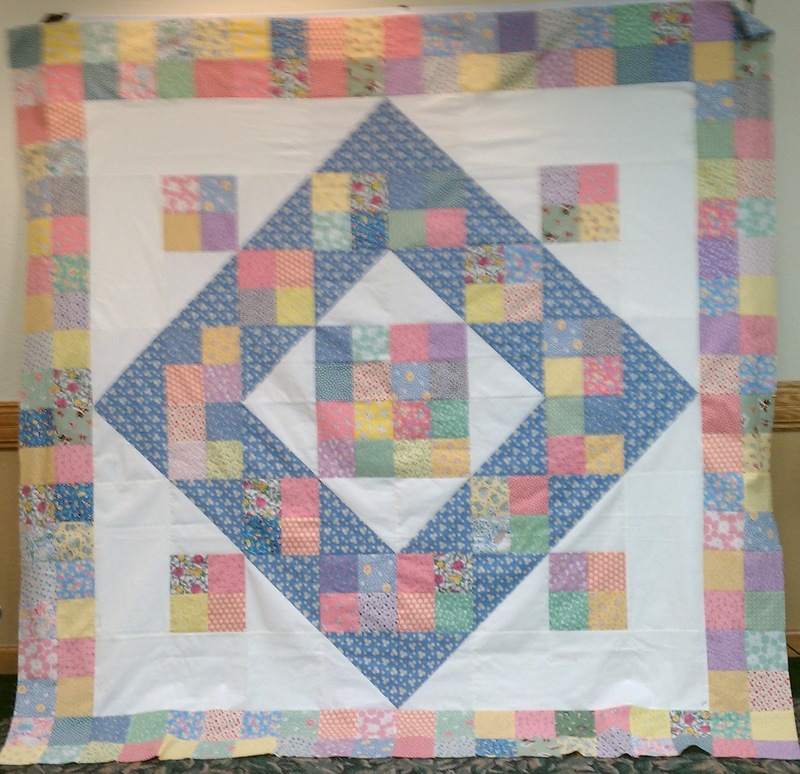 I love this quilt and can't wait to get it finshed and displayed in my living room. No. 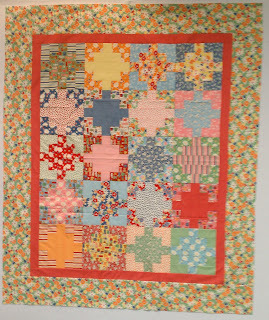 8: This sweet little quilt is for my great-neice, Harper Grace! (Don't you love that name -- it sounds so "southern") I used "Yellow Brick Road" by Atkinson Designs and a funky & bright floral collection. I don't remember the name of the fabric line. 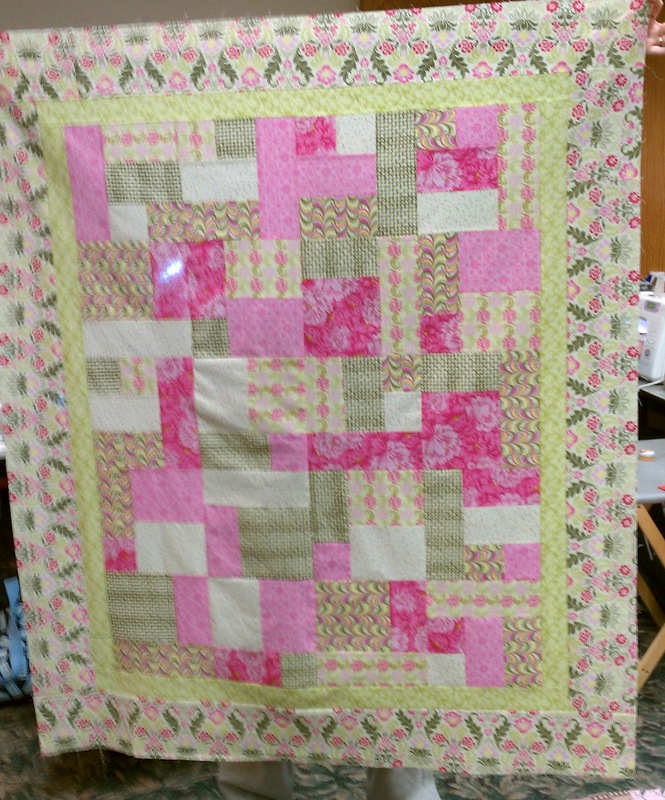 I did get this one quilted and will be doing the binding over the next few days. Watch for pictures!!! No. 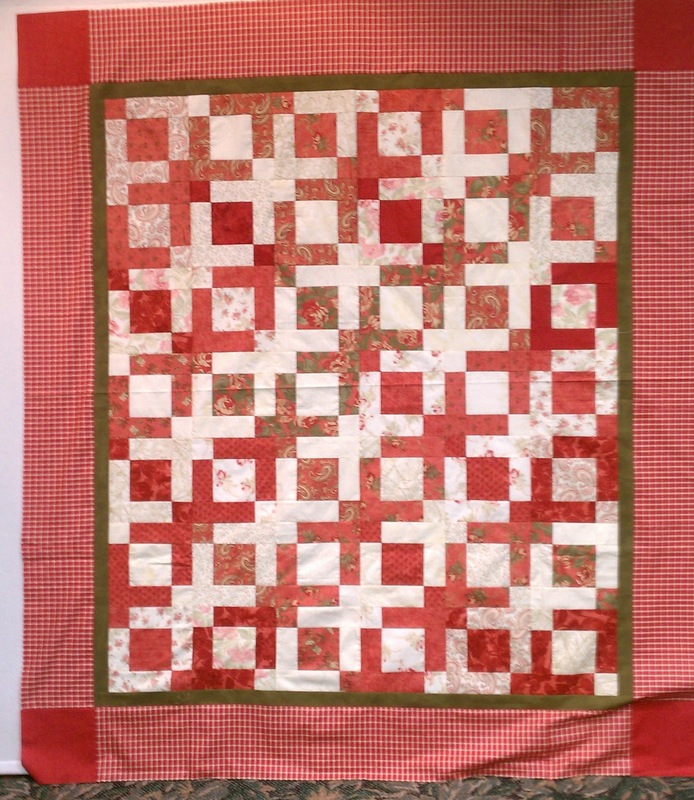 9: A cozy flannel quilt for Mom. 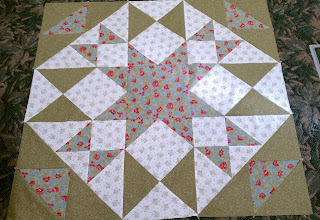 She saw this one last January after I finished quilting one for the shop as a sample ... now she'll have one of her own. No. 10: A cute wall hanging from the book "Sew One and You're Done" ... I used some 3 Sisters fabrics. 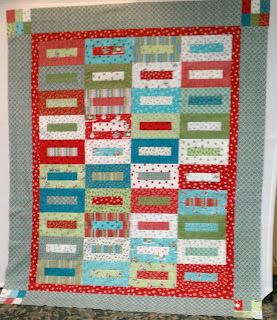 I keep looking at it wondering if I need to add a border or just bind it in a red fabric. What do you think? No. 11: Ooops ... no picture of this one. No. 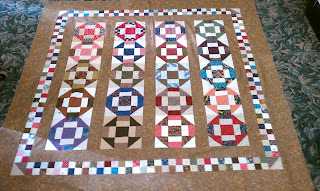 11 was a table runner I had quilted using a Civil War cheater fabric. The binding was already sewn to th front of the runner, I just had to do the hand sewing to the back. So, not bad for a three day retreat. The next one is in April --- wonder what I can get done then! WTG...cranking out the projects! I need to get started on some of my UFO's and projects that I haven't even begun! ;) Keep posting pics...love to see what you're accomplishing!